Application Notes: E2 conjugating enzyme for ubiquitinylation reactions. Use/Stability: Stable for at least 1 year after receipt when stored, as supplied, at -80°C. Scientific Background: The anaphase-promoting complex (APC) coordinates mitosis by sequentially promoting the degradation of key cell-cycle regulators via the ubiquitin-proteasome pathway, utilizing the ubiquitin E2 conjugating enzyme UbcH10 and K11-linked polyubiquitin chain modification of substrate proteins. Following the degradation of its substrates, the APC catalyzes the autoubiquitination of UbcH10 resulting in its degradation and subsequent inactivation of the APC. Aberrant performance or modulated cellular levels of UbcH10 or any of its associated components is likely to have significant consequences for cell cycle regulation. UbcH10 expression has been shown to be a valid indicator of the proliferative and aggressive status of thyroid carcinomas and its overexpression is thought to play a role ovarian carcinogenesis. 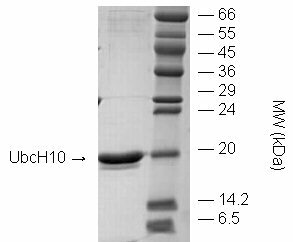 In contrast expression levels of UbcH10 are extremely low in many normal cells. Such observations suggest the possibility of using UbcH10 detection as a marker for the diagnosis and prognosis of neoplastic diseases and open the possibility of a therapy of some carcinomas based on the suppression of the UbcH10 synthesis and/or function.